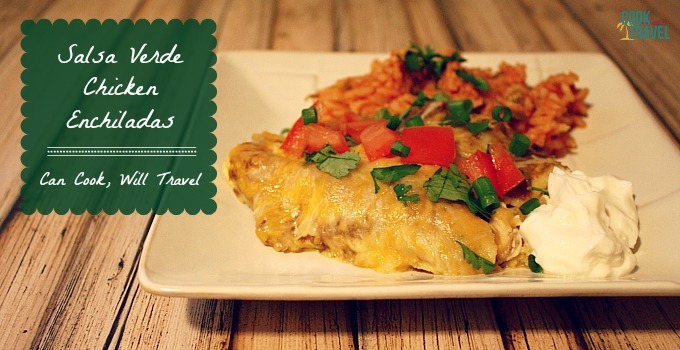 You are here: Home / Blog / Main Dishes / Salsa Verde Chicken Enchiladas – Say Olé! 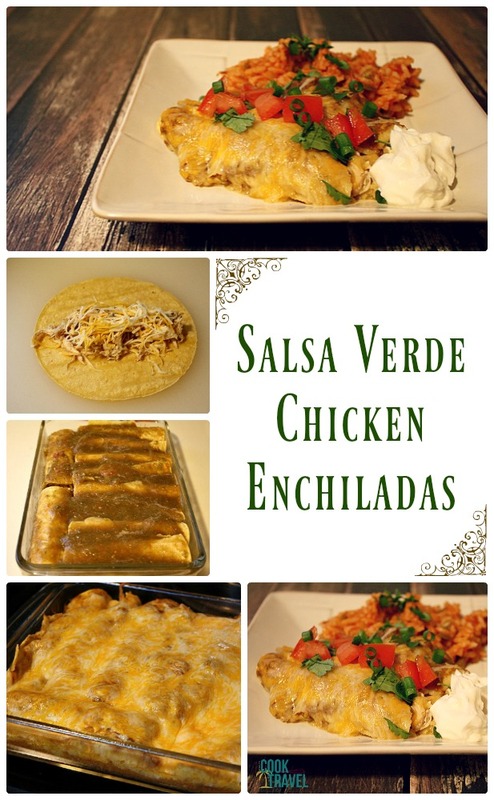 Salsa Verde Chicken Enchiladas – Say Olé! I like to think I’m a pretty laid back and chill girl. But this week has been so nonstop with work that it’s a wonder I am still sane. Well, that’s probably debatable. Let’s just say that it took me 3 trips to the grocery store to get everything I actually needed to whip up these Salsa Verde Chicken Enchiladas. On trip 1, I thought I had everything. Then came trip 2, where I thought I was only missing 2 spices. But trip 3 occurred because I was getting ready to make the salsa verde, and I realized that I needed 4 more things, cuz you gotta have Spanish rice as a side dish! Now let’s take it back a bit. My dear friend Rebecca has a helluva green thumb, and when she brought me a container of homegrown tomatillos, I got really excited! I hadn’t had a chance to cook with tomatillos before, but I’ve been really wanting to. So then it was the age old question of: What will I make with these green guys? Salsa Verde seemed like a no brainer and I couldn’t get the idea of covering enchiladas with said salsa verde out of my head. So I found this awesome recipe from the blog From Cats to Cooking and didn’t look back! 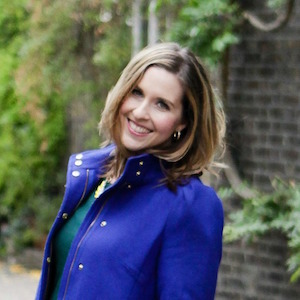 Not only did Isabel have a salsa verde recipe but she had a fab looking enchilada dish, so it was meant to be. I had no clue what was in salsa verde, but it was actually crazy easy to make. Just simmer some tomatillos and jalapeños (de-veined and seeds removed) until they were tender. Then blend them with a tomato, a raw jalapeño with seeds, green onions, salt and minced garlic. That is it! And you come away with a salsa that smells so freaking good. The enchiladas were really easy to make. I poached my chicken with my trusted poaching method (thanks Chrissy Teigan) and then shredded the chicken. Toss the chicken with some olive oil, lime juice, and spices. Then fill the corn tortillas with chicken and cheese, roll them up and pour the salsa verde over the top. Top with more cheese and bake. Honestly making these Salsa Verde Chicken Enchiladas was a lot easier than I expected. And if you’re looking for ways to save time, you can poach the chicken and make the salsa ahead of time. Heck, you can buy your salsa, but this recipe was so easy to make that it’s definitely worth making it yourself if you can. The only thing that I will do differently next time, and there will be a next time, is that I’ll use flour tortillas instead. The corn tortillas are great, especially if you need a gluten free option. But I like flour tortillas because they hold up a bit better. I also made an executive decision to put a little cheese in my enchiladas, because you can never have too much cheese, now can you?! So what the heck are you waiting for?! 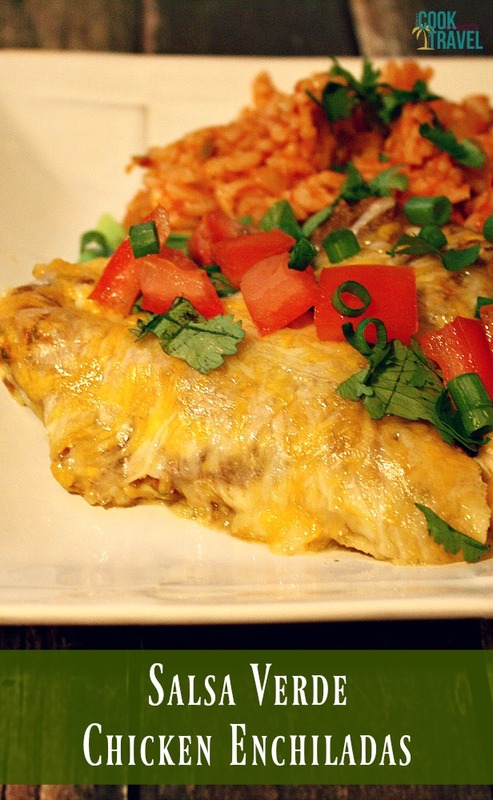 Go grab some tomatillos and whip up this Salsa Verde Chicken Enchiladas right away. You’ll be glad that you did! Click that link for the recipe and step by step instructions! Happy salsa-ing! One year ago: How To Make Homemade Almond Butter – Could It Be Any Easier?! Two years ago: Jalapeno Popper Taquitos … Yep, That Happened!